The MotoGP™ paddock will arrive at the Losail International Circuit this week for the start of the 2015 season. After months of waiting the first round is upon us and what a season it promises to be, as already during preseason testing a few surprises have been thrown up with some big stories making the headlines. 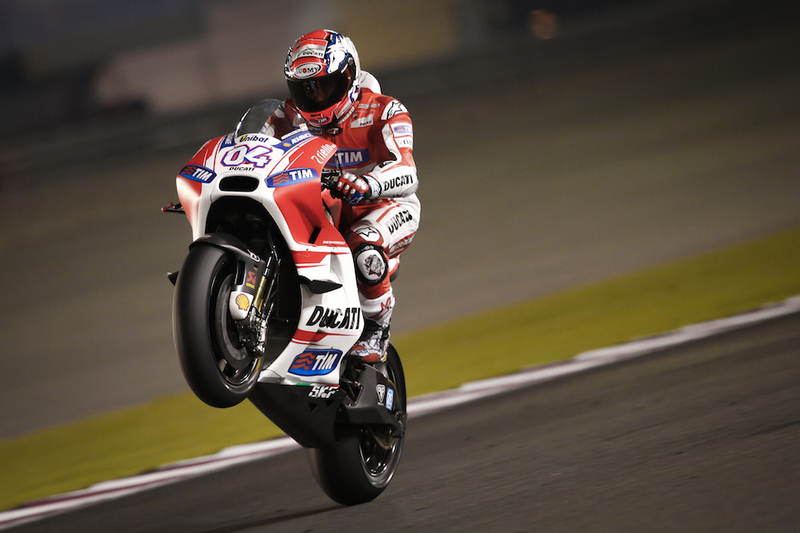 Ducati have dramatically come back with a competitive machine for 2015, with the Luigi Dall’Igna designed Desmosedici GP15 dominating the final preseason test in Qatar. The new machine is not only fast, but the Italian factory team seemed to have finally cured the understeer problem that affected previous versions of the bike. While the GP15 has shown good pace since it debuted at the second test in Sepang, it will be interesting to see how it performs over the race distance under the floodlights at the Losail Circuit in the hands of the Ducati Team riders Andrea Dovizioso and Andrea Iannone. Suzuki have returned to MotoGP™ with an all new factory squad, featuring riders Aleix Espargaro and class rookie Maverick Viñales. They have been developing the GSX-RR machine over the last year, and already it has proved competitive, plus the team believes there is a lot more potential to unlock in the bike throughout the season. On the subject of comebacks, Aprilia have also returned to the MotoGP™ grid for 2015, although this year will be more of a season-long test for riders Alvaro Bautista and Marco Melandri, as they look to develop the RS-GP bike to be competitive in 2016. 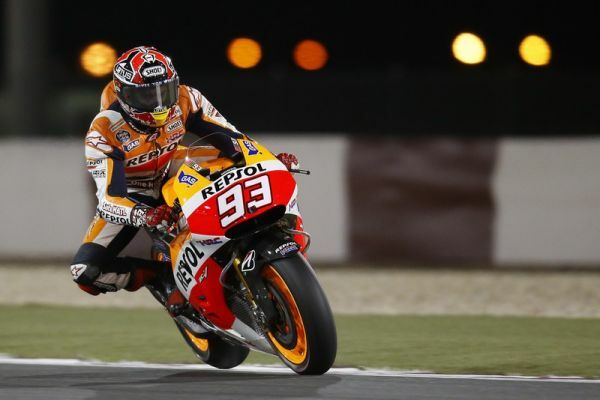 Repsol Honda’s Marc Marquez will be looking to defend his title once more, having claimed back-to-back championships in the past two seasons. The young Spaniard believing that the serious challenge for the title will not come from Ducati, but his own teammate Dani Pedrosa and the Movistar Yamaha’s. Valentino Rossi and Jorge Lorenzo will be desperate to wrestle the title form Marquez’s grasp, and with 11 world titles between them plus a renewed determination this season, the Movistar Yamaha team will be looking to claim the Championship once more. Rossi experienced a resurgence last season, having made some changes behind the scenes, while his teammate Lorenzo ended the season brilliantly, after a disastrous start to 2014 effectively cost him any chance of the title. There is also the interesting battle of the satellite teams with riders Cal Crutchlow on the CWM LCR Honda RC213V, Scott Redding on the factory spec Estrella Galicia 0,0 Marc VDS Racing Honda, the Tech 3 Yamaha’s of Bradley Smith and Pol Espargaro plus the Pramac Ducati’s of Yonny Hernandez and Danilo Petrucci all set to do battle in Qatar. In the Open class it was Karel Abraham who ended on top at the final preseason test, but it should prove to be an interesting season-long battle between the Drive M7 Aspar Honda RC213V-RS’s of Nicky Hayden and Eugene Laverty along with the Avintia Ducati’s of Hector Barbera and Mike Di Meglio, and the Athina Forward Racing Yamaha’s of Stefan Bradl & Loris Baz. Plus Jack Miller, the runner-up in the Moto3™ Championship last year, will be looking to impress on the Open spec CMW LCR Honda, while Alex de Angelis is on the Octo Ioda Racing ART Machine. In 2015 the number of riders competing in the MotoGP™ class has increased to 25 – up from 23 in 2013 – and this season there will be more riders on the grid that have won Grand Prix World Championships than ever before. Twelve riders, who have won a total of 18 titles between them, will line up under the lights in Qatar to compete in the first round, along with 4 rookies to the class in the shape of Viñales, Miller, Laverty and Baz. The schedule for the Commercial Bank Grand Prix of Qatar differs from other rounds in that it is spread over 4 days, with two days of free practice commencing on Thursday, qualifying on Saturday, and the MotoGP™ race scheduled to start at 9pm local time on Sunday night. The 2015 Moto2™ World Championship starts this weekend with the Commercial Bank Grand Prix of Qatar. After the recent weather-affected final preseason test in Jerez, it is hard to predict any favourites for the 2015 Moto2™ title as riders prepare to do battle under the lights at the Losail International Circuit in Qatar. Tito Rabat becomes the first ever Moto2™ World Champion since the class began to attempt to defend his title on the Estrella Galicia 0,0 Marc VDS Racing Kalex, with previous Champions having decided to move up to the MotoGP™ class. Rabat is joined in 2015 by two of the top three Moto3™ riders from last season as well as 14 of the top 15 riders in the Moto2™ standings from 2014, with only Maverick Viñales having left the class to join the factory Suzuki Ecstar team in MotoGP™. Speed Up Racing´s Sam Lowes will hope to continue his preseason form during 2015 as he begins his second season in the class, while last years Moto2™ runner-up Mika Kallio has made the switch this year to the Italtrans Racing Team. With serial contenders like Johann Zarco, Luis Salom, Axel Pons, Simone Corsi, Thomas Luthi and Rabat´s new teammate, the 2014 Moto3™ World Champion Alex Marquez, also lining up on the grid, it is shaping up to be an incredibly competitive season. The Commercial Bank Grand Prix of Qatar starts on Thursday with two practice days for the riders, before qualifying on Saturday, with the Moto2™ race due to take place at 19:20 local time on Sunday night. The 2015 Moto3™ World Championship begins with the Commercial Bank Grand Prix of Qatar this weekend. The Moto3™ class has always been a platform for the best young riders in the world to showcase their talent, and for 2015 this is no different with only four riders competing in the Championship over the age of 21. Frenchman Fabio Quartararo will be the youngest rider to ever to compete in a full season in Moto3™, at just 15 years and 343 days, with the organisers having changed the rules this year to allow someone under the age of 16 to take part in a race. Quartararo was the CEV Repsol Moto3™ Champion from 2014, and has already impressed a number of people with his pace during preseason, having joined the Estrella Galicia 0,0 Team for 2015. There are a number of new faces that will line up on the grid in 2015, including last years Red Bull Rookies Cup Champion Jorge Martin, who will be joined by Juanfran Guevara and Francesco Bagnaia on the on the Mapfre Mahindra Team. Quartararo is joined in the Estrella Galicia 0,0 Team by the man who finished runner-up to him last year, Jorge Navarro, while Gabriel Rodrigo will be the first ever Argentinian to compete in Moto3™, for the RBA Racing Team. Maria Herrera will be the second female to compete full-time in the Moto3™ class alongside Ana Carrasco, as she becomes teammates with Isaac Viñales in the Husqvarna Factory Laglisse Racing Team. Efren Vazquez, who took two race wins last year on his way to 4th in the championship, lines up alongside British rider Danny Kent for the Leopard Racing Team, with Scottish rider John McPhee also returning to the the grid with the Saxoprint-RTG Team. Karel Hanika, Brad Binder and Miguel Oliveira make up an extremely competitive Factory Red Bull KTM Ajo team, while the rider who finished the championship in 5th last year, Romano Fenati, is joined by compatriot Andrea Migno in the Sky Racing Team VR46. A total of 14 nationalities will be represented on the grid when the lights go out in Qatar, and with less than 0.6s separating the first six across the line last year, it once again promises to be an exciting start to the 2015 Moto3™ World Championship. Teams have an extra day of practice at the Losail International Circuit to prepare for the season opener, with things kicking off on Thursday in Qatar ahead of qualifying on Saturday and the Moto3™ race scheduled to take place at 6pm local time in Qatar on Sunday.